Tarantino is, arguably, the most pre-eminent auteur of our time. No other film director in the last couple of decades has established such an immediate and widely recognised style. But what happens when that style loses its uniqueness and is watered down by endless repetition? This is an issue with Django Unchained, yet another Tarantino revenge film - this time within a Western setting that marries sound ethics with extreme violence and comedy. 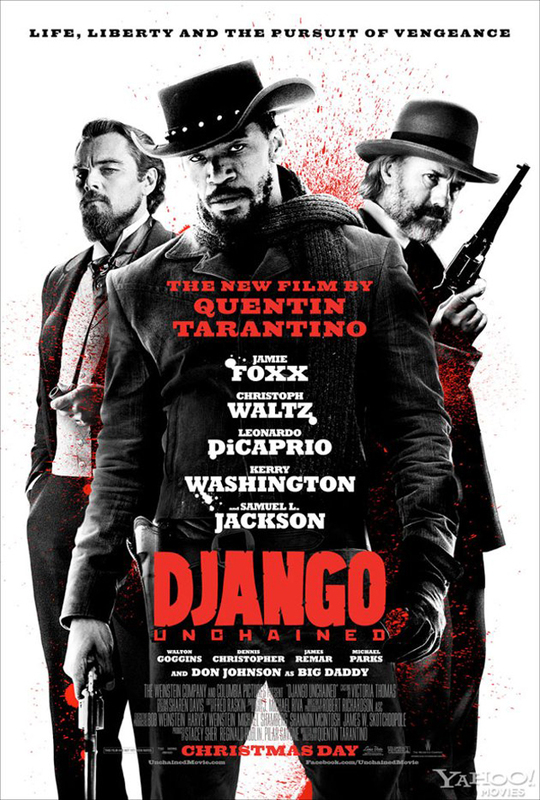 This is a film that celebrates the outsider, whether Christoph Waltz's German bounty hunter Dr Schultz, or Jamie Foxx's titular black slave; together, they plot to rescue Django's wife from slavery. In the process, Django is a man forced to betray his own people in the face of barbaric violence - he must act as a white man (and alongside a white man) to achieve his goals. Whether this is a film about black emancipation or white racial guilt is certainly up for interpretation, but undoubtedly the unlikely friendship between the two protagonists is thrilling to watch unfold. Django Unchained contains all the typical hallmarks of a Tarantino film: the camera movement and zooms; the cartoonish violence (complete with lashings of bright red blood); the witty script filled with elaborate monologues; the punchy soundtrack; and, of course, the cameo from Tarantino himself. The film is full of both Western and Tarantino cliches - the source of much amusement on top of the often comedic script. Yet it also offers nothing we haven't seen before. For all its pulp entertainment, this is less iconic than his best. The language is as extreme as the violence (with the 'n' word cropping up at an alarming rate), but if you're squeamish then you already know not to watch a Tarantino film. It also suffers from pacing problems. As you'd expect, much of the film is taken up with long episodes of script, whilst the resolution occurs all too suddenly at the end, though it does provide a suitably bloody conclusion. Each set-piece along the way is gripping, but the film does lack Tarantino's usual flare for narrative complexity and flashback. What Tarantino is best at, however, is getting the best performances out of his actors and Django Unchained is no different. 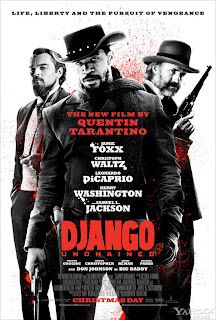 Foxx's Django, like many of the black characters, begins as an almost childlike presence, but soon grows into a Clint Eastwood-esque brooding cowboy - one who retains a clear sense of compassion. Waltz received numerous awards for his portrayal of Dr Schultz and with good reason - his use of language is delicious, alongside numerous character quirks. It's the return of Samuel L Jackson who somewhat steals the film, however, with some hilarious moments as the bumbling old Stephen. Django Unchained is as bold, brash and audacious as audience's have come to expect from Tarantino's oeuvre. A lack of true innovation in his style might hamper the film, but it still packs a solid punch.